Hello, Never Fully Dressed readers. With the holidays coming up, I'm running a special series sharing some of the holiday classics that have stood the test of time. Some might be new to you; some might be favorite films, but they're all sure to impart a sense of that holiday fun. Named for one of the world's most well-known songs, White Christmas is a holiday musical worth coming back to. Detractors will say that it is corny- and it is. It's a holiday musical- what else would it be? They will say it is not deep, and that the plotline is thin. They might even say that it's been done before. True, all. Despite that, it is still a movie worth watching. The Irving Berlin song "White Christmas" had originally appeared in another musical film, Holiday Inn, starring Bing Crosby and Fred Astaire. 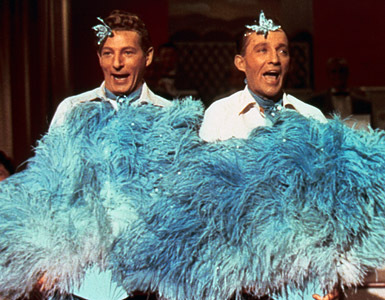 Twelve years later, in 1954, it was still the most popular musical single in history, so the movie studios decided to try for a loose remake of the film. Astaire turned down the script, and eventually Danny Kayes was found to star opposite crooner Bing Crosby. That wasn't the only change either- though some of the songs are the same, and most of the action once again takes place at a country inn (even the set was the same! ), the essential story is quite a bit different. Characters are given more altruistic goals, and higher standards for others' actions, and that is what gives White Christmas such heart. When Bob Wallace's (Bing Crosby) life is saved by private Phil Davies (Danny Kaye) during World War II, he's grateful. He just doesn't realize that his life- as far as Davies is concerned- is never going to be quite his own again! Once peacetime hits, the two men start a musical act together and become successful performers- so successful they start up a whole musical and are busy from dawn to dusk. Davies laments he'll never have any free time unless Wallace gets himself a girl, but even he is surprised when the perfect opportunity lands in their laps. A sister act is in a bit of trouble. With some pushing on Davies' part, the duo not only saves the day, but ends up accompanying sisters Betty (Rosemary Clooney) and Judy (Vera-Ellen) to their next gig in Vermont. Vermont has surprises of its own though. There's no snow and no audience at the inn they're performing at. What is there is an old friend. The men's former commanding officer is now the unfortunate inn-keep of an inn with only empty rooms. Romantic hi-jinks, musical numbers, and plenty of slang-laden banter ensue as Wallace and Davies try to draw a crowd and save the inn in time for Christmas. The film is high energy and fun-loving. This is partially because the dialogue is witty, and fast-paced, aimed for some good laughs. Many of "Bob Wallace's" more unusual slang terms and sentence structures were actually based on Bing Crosby's real-life speaking patterns. Several of the best scenes were also largely improvised. For example, Crosby and Kayes performing the sisters' act was added after the director found some on-set clowning around funny enough to write into the script. Even the more serious scenes are well written; some of the romantic complications might be a little flimsy, but what the characters say to each other makes them more believable.The real show stoppers though, are the musical numbers. With one exception ("What Do You Do With a General?" was called Berlin's least memorable song by Leonard Maltin), every musical number is a hit, and they range from the intimate and Academy-Award-Winning song "Count Your Blessings" to huge dance numbers like "Mandy" and "Choreography." On a more personal note, this is the film my own family has made a tradition of watching every year at Christmas, and once you watch it, you'll be just as likely to have the same tradition yourself. So- whether there's snow on the ground or not- I hope you have a White Christmas. Happy Holidays, folks. I look forward to watching this with my fam every year! I just adore the characters and all the music in it. 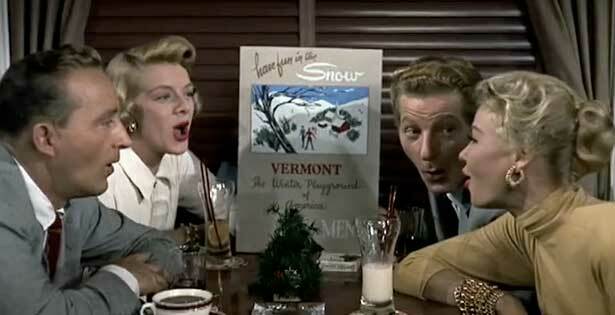 And i will admit that I always wanted to be Rosemary Clooney :) Interesting background - I always wondered about the relation between White Christmas and Holiday Inn. This is one of my favorite Christmas movies ever! Such a wonderful idea! : ) I love this time of year and rewatching all of my favourite Christmas movies! I love this movie. I think I might go put it on again now! Would you believe I've never seen this movie all the way through? I always catch it somewhere in the middle...I need to rent it one of these years! You definitely should watch it; I think you'd love it. If you do, let me know what you think! Old holiday movies are the best! Wow haven't seen this movie in years, we used to watch it on TV as a family when we were little! I love this movie! I always did the "Sisters" song and dance when I was little!! Some stories never get old. Aha, this is the one we should watch today! My favorite experience seeing this was when they installed a drive-in theater in Lubbock and I got to see it with my new college friends as a freshman! Oh! That would be such a fun way to watch this!! Heehee, just read this again and wanted to tell you the same story again! I enjoyed the tidbit in this review about how the guys doing the sisters number was added.